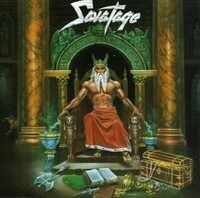 With band members, critics, and fans unhappy with the commercialism of Fight for the Rock, Savatage began to disintegrate. However the new found acquaintance of producer Paul O'Neill not only changed the group's fortunes but soon pointed them in new directions. O'Neill, who was looking for a metal band to record some of his musical ideas, agreed to produce the group's next album, which became Hall of the Mountain King. A return to the form of Dungeons Are Calling, Hall of the Mountain King was the great album the band had always threatened to make. Featuring blistering guitar riffs, numerous tempo changes, and over-the-top screeching vocals, Savatage were finally captured by decent production after two albums of attempts to put a pop sheen on their music. Returning mostly to dark fantasy subject matter, "Devastation," "Legions," and the epic title track sounded more confident and tighter than anything on their previous two records, featuring dynamic rhythms courtesy of bassist Middleton and drummer Wacholz. The catchy pop-metal of "Strange Wings" was ironically a better song than any of the band's more blatant attempts at commercialism. Meanwhile, "24 Hours Ago," one of three tracks the group co-wrote with O'Neill, was an impressive opener with an interesting tempo changes and personal lyrics that pointed to the direction the band would soon take. Fans of the later, more progressive Savatage might not enjoy the group's earlier work, but this is a fine place to start looking.